A couple of months back, my daughter got an eye infection. I messaged her pediatrician and was asked to give eye drops. After 3-4 days, the redness was reduced but didn’t clear completely. So we wanted to meet the pediatrician to ensure that it was just a viral infection. It turned out that the doctor was extremely busy and we couldn’t get an appointment that day. When we met her the following day, she mentioned that she was in her clinic from 9AM to 6PM the previous day with non-stop appointments. I’m not sure about other cities in India but in Bangalore, kids are falling sick often these days. Is it because of the changing weather conditions or the increase in pollution levels? Given that most such illnesses are viral and contagious, they spread faster to many children. Cold, cough, running nose, flu, wheezing, fever - young kids get affected with one or more such issues almost on a monthly basis. Pharmaceutical companies and packaged food manufacturers are well aware of this fact. Health drinks and supplements targeted towards improving immunity in children are on the rise. Pediasure’s ad campaign is mainly focused on this promise of boosting immunity. I had earlier written about the ingredients present in Pediasure and why it is totally unnecessary for your child. Do check it out if you haven’t already. 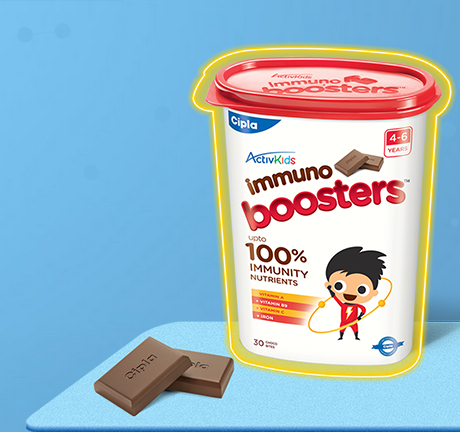 Recently, I stumbled upon an ad for Cipla’s Immuno boosters, a nutritional supplement in the form of chocolate-bites. 30 pieces (one piece per day) cost Rs.299 and so one single piece is around Rs.10. The price point seems attractive, but let’s first look at the ingredients and nutrition information. 1) The ingredients list resembles that of any other milk chocolate available in the market - milk solids, sugar, hydrogenated vegetable fat. 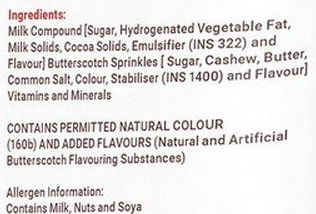 Yes, each of these "nutritional supplement” choco-bites contain sugar(2.39 gm or little more than 1/2 tsp of sugar) and trans-fats (0.01 gm). 2) Artificial flavours are used, without sharing any details. As consumers, don’t we need to know the ingredients added for flavour? What if these flavour ingredients are addictive in nature? 4) Emulsifier and stabiliser - in a nutritional supplement? Seriously? Now that we have seen the list of harmful ingredients, let’s take a look at the actual “promise” of nutrition - vitamins and minerals. This number in absolute form might seem high, but when we compare it to a few natural sources of Vitamin A, you’ll realize how low it is. 100 gm of raw carrots contain 835 mcg of Vitamin A. 100 gm of cooked sweet potato contain 787 mcg of Vitamin A. The numbers speak for themselves, how would an artificial supplement with just 30 mg of Vitamin C boost our kid’s immunity? Do we need to rely on such artificial supplements to boost immunity of our children? Not required at all. 1) Cut down sugar-loaded junk foods as much as possible. Avoid buying packaged foods. Take a tough stance here as a parent and don’t bribe the kid with sweet treats to get things done. And let’s not fool ourselves by thinking that kids would burn the excess calories. It is not only about calories and weight gain. Added sugar reduces immunity drastically. Watch this video by nutritionist Luke Coutinho to understand the impact of white sugar on immunity. 2) There are multiple natural ways to boost immunity using Vitamin C rich foods - gooseberry, guava, orange, bell peppers etc. I have compiled a detailed list in this article on Vitamin C. Do check it out. Apart from Vitamin-C, Vitamin A, Vitamin B6 and Zinc also play an important role in building immunity. Check out the list of natural sources in my earlier articles on Vitamin A and Zinc. Will write about Vitamin B6 soon. 3) Reduce milk and milk based products. I’ll keep reiterating this over and over, as I just can’t bear to see kids who have wheezing issues and been force fed milk every single day by their parents. The excess mucus is triggered by dairy products, causing frequent bouts of cold and cough in kids. I have found ragi/finger millet to be effective in reducing mucus. Make ragi idlis, ragi dosas and ragi pooris 2-3 times a week. Apart from reducing mucus, ragi is an excellent source of calcium and iron. 4) Include spices every day in their diet. Spices such as cumin, pepper, turmeric, coriander seeds, long pepper, ginger, garlic etc can be easily incorporated into your child’s diet in the form of soups, rasam rice, pongal and kichdi. Let your child’s meals include these typical Indian traditional dishes on a daily basis. The pasta and noodles can be occasional visitors. 5) Allow your child to play in the open. Fresh air and sunlight helps to boost their immunity. Let fresh air flow easily in your home. Keep the mesh windows/doors open for good air circulation. This was a thoroughly well researched post, beautifully expressed. Thanks for sharing! Wow, I landed her and I am impressed with the kind of research you have put in. Wonderful article. I am using this product for my kid.i observed that her stool timing got changed.i mean she is getting urge of going to rest room in morning early hours .cou co you please let me know the side effects of the project.No where I can see the side effects. @Unknown, Not sure why you are using this product. The brand will never specify the side effects. If it is not agreeing with your kid, it is better that you stop it. When I look at the ingredients its says " Milk Compounds ( Sugar, Hyd Veg Fat, Milk, Cocoa Solids, Emulsifier, Flavour, Butterscotch sprinkles, Stabiliser, Flavour & finally Vitamins and minerals. Looking at the ingredients like Fat n Sugar, really wondering from where the mentioned benefits on the Box like "Immune Buildup , Blood formation, Immune Cell formation, antioxidant protection , Skin barrier strengthening come from"" ????? Any research, proofs of experiments in India? Or Just marketing gimmick ?? Thanks for sharing such a useful piece of information. Your research and arguments are unbeatable. Cipla boosters are good for child health. It's really nice piece of information. I was giving my son this product as I though it is better than other chocolates if he eat chocolate every day. But really giving natural products are always safe. I also observed that this makes a child sick. I had stopped this but I thought that it has iron which fulfils 70 percent of child daily requirement if iron. You can not make child eat palak daily for iron needs. This country is full of thiefs and unethical businessmen.